Aims : The objective of thisstudy is to evaluate and compare 4% titanium tetrafluoride with 2% Sodium fluoride, and the bond strength of composite resin with dentin and their effects on the smear layer. Materials and Methods: Fifty freshly extracted non-carious molar and premolar teeth were selected. The occlusal surfaces of the teeth were ground, to prepare flat dentin surfaces at a depth of 2 mm and were randomly grouped with 10 specimens in each. Group I (Etching + Adhesive + Composite resin) was taken as a control group. In Group II, 4% titanium tetrafluoride was applied before etching and in Group III, 4% titanium tetrafluoride was applied after etching. In Group IV, 2% Sodium fluoride was applied before etching and in Group V, 2% Sodium fluoride was applied after etching. Shear bond strength was tested using the Lloyds Universal testing machine and was recorded in MPa. Results : The results were statistically analyzed using the one-way Anova test. Group III showed the highest bond strength among the experimental groups, but less than the control group. Conclusions : Under the conditions of this in vitro study, titanium tetrafluoride did not significantly affect the bond strength of the composite. Sodium fluoride was found to deleteriously affect the bond strength of the composite. The prerequisites for good adhesion of the composite resin to the tooth structure, is that the adherent surfaces be clean and compatible, which is often difficult to attain and maintain. As the tooth surface is altered by rotary and manual instrumentation during cavity preparation, the smear layer is generated. The role of the smear layer is still controversial. However, a smear layer that can be modified to become stable and resistant to microleakage may be very beneficial for the long-term success of resin restoration. 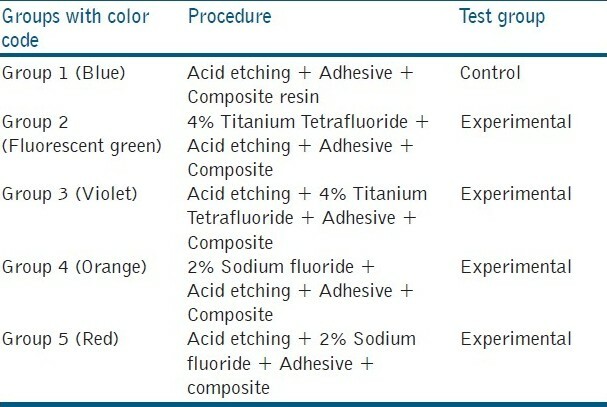 The details of the materials used for the present study are given in the [Table 1]. The occlusal surfaces of the teeth were ground just below the Dermal-Epidermal Junction (DEJ), in an orthodontic model trimmer, using water as a coolant. The horizontal-sectioned teeth were embedded in rectangular aluminium blocks of 1.5 Χ 1.5 Χ 2.5 cm and stabilized with the help of self-curing resin, exposing the cut dentin [Table 2],[Table 3],[Table 4]. Light curing was performed for 40 seconds. The cured cylindrical composite resin button measuring 3 mm diameter and 2 mm thickness was pushed out of the Teflon mold with a ball burnisher. The test specimens were then stored in distilled water for seven days before subjecting them to the shear test. Testing the shear bond strength: The specimens were held horizontally in the lower member of the shear chuck, available especially for testing the shear in the Llyod's Universal testing machine. The equipment was operated at a cross-head speed of 5 mm / minute and maximum load, was recorded in newtons. Shear bond strength was calculated in MPa. Statistical analysis: Mean and standard deviation were estimated from the sample for each study group. Inter-group comparisons were done using one way Anova followed by the Seheffe Host Hoc test. A p-value ≤ 0.05 was considered. The statistical calculations were executed using the SPSS software. The fracture mode under stereomicroscopic examination of groups 1, 2, and 3 exhibited to be predominantly cohesive in material and mixed failure (cohesive in material). Groups 4 and 5 revealed a predominantly adhesive variety. SEM observation: Photomicrographs of Groups 2 and 3 showed tenaciously attached Titanium-rich coating. In Groups 4 and 5 tenaciously bound coating was not seen and few patent dentinal tubules were present. Use of Titanium Tetraflouride solution as a smear layer modifying agent is a recent development. There is a rapid formation of complexes between Titanium Tetraflouride or its derivatives and the phosphates or organic material present in the dentin. The complex formed is 'a glaze, which is known as an organometallic complex. This forms a tenacious Titanium-rich coating on the tooth surface. The coating is stable and resistant to acids (HCl) and alkaline (KOH) washing procedures. , An approximately 0.1 micro-mm thick, electron-dense coating along the surface of the demineralized layer is a constant finding in the Titanium Tetafluoride-treated surfaces. Among the fluoride preparation, 2% Sodium fluoride was commonly used for topical application as it was found that it had a caries preventive effect. Various percentages of titanium tetrafluoride were tried, such as, 1%, 3.4%, and 4%. , Buyukyilmaz observed that when 4% Titanium tetrafluoride was used on these teeth surfaces, there were fewer cracks and higher resistance to alkali than with 1% titanium tetrafluoride solution. Hence, in the present study, 4% titanium tetrafluoride was used. Sen et al. evaluated the effect of 4% titanium tetrafluoride solution on root canal walls, with and without smear layer, by scanning electron microscopy. SEM observation of the smeared canal walls showed that titanium tetrafluoride solution modified the smear layer and produced a massive structure, and in the smear-free group a granular coating was formed on the intertubular and intratubular dentin. Hence, Titanium tetra fluoride was applied after etching, to evaluate the effect of titanium tetrafluoride on bond strength. ,, From the results of the present study, no statistically significant difference has been found between the bond strength of Group 1 and (Groups 2 and 3). This is because the mechanism of adhesion is similar in both the groups, namely, the modified smear layer concept. Hence, the bond strength values are not significantly different between the two groups. However, the Group 2 bond strength values are lower than the Group 3 values. This may be because of the inadequate etching achieved due to fluoride exposure. In Group 3, as the etching was carried out first, a better organometallic complex with the hydroxyapatite was formed on application of TiF4. Hence, a higher bond strength value compared to Group 2 was obtained in Group 3. The bond strength values for the NaF groups (Group 4 and 5) were the lowest among all the groups. This statistically significant difference was due to the fact that Sodium fluoride did not form organometallic complexes with dentin, unlike titanium tetrafluoride, resulting in an interface that was quite weak, causing decreased bond strength. The results of the stereomicroscopic examination revealed that the control group and titanium tetrafluoride groups showed predominantly cohesive failure within the material or mixed failures (within material), while the Sodium fluoride groups gave predominantly adhesive variety. For the Sodium fluoride group, where etching was done first and then Sodium fluoride was applied, no thick coating was found. This was because Sodium fluoride did not chemically bind to the tooth structure. Where Sodium fluoride was applied and then etched, less dentinal tubules were found open, because the etching was inadequate on a fluoridated tooth surface. Titanium tetrafluoride application on dentin did not significantly affect the bond strength of the composite resin. Sodium Fluoride application on dentin was found to deleteriously affect the bond strength of the composite. 1. Tveit AB, Tötdal B, Klinge B, Nilvéus R, Selvig KA. In vivo Fluoride uptake by dentin surfaces following application of TiF4, NaF and fluoride varnishes. Caries res 1985;19:240-7. 2. Tveit AB, Halse A. The effect of a NaF solution and fluoride varnish on the acid resistance of root dentin. Acta odontol scand 1982;40:35-43. 3. Tveit AB, Klinge B, Tötdal B, Selvig KA. Long term retention of TiF4 and SnF2 after topical application to dentin in dogs. J Dent Research 1988;96:536-40. 4. Clarkson B, Wefel J. Titanium and Fluoride concentrations in TiF4 and APF treated enamel. J Dent Res 1979;58:600-3. 5. Wefel JS. The effect of topical fluoride agents on fluoride uptake and surface morphology. J Dent Rese 1981;61:1169-71. 6. Johnson ME, Burgess JO, Hermesch CB, Buikema DJ. Saliva contamination of dentin bonding agents; storage and thermocycling effects on bond strength of dentin adhesives. Oper Dent 1994;19:205-10. 7. Kameyama A, Oda Y, Hirai Y, Kawada E, Takizawa M. Resin bonding to Er: YAG laser irradiated dentin: Combined effects of pre-treatments with citric acid and Glutaraldehyde. Eur J Oral Sci 2001;109:354-60. 8. Skartveit L, Spak CJ, Tveit AB, Selvig KA. Caries inhibitory effect of titanium tetrafluoride in rats. Acta Odontol Scand 1991;49:85-8. 9. Skartveit L, Selvig KA, Tveit AB. Root surface reactions to titanium tetrafluoride and Stannous fluoride solutions in vitro - An Ultrastructural study. Acta Odontol Scand 1991;49:183-90. 10. Skartveit L, Tveit AB, Tøtdal B, Selvig KA. Effect of titanium tetrafluoride solutions on root surfaces invitro after different application periods. Acta Odontpl Scand 1989;47:25-30. 11. Büyükyilmaz T, Ogaard B, Rølla G. The resistance of titanium tetrafluoride treated human enamel to strong Hydrochloric acid. Eur J Oral Sci 1997;105:473-7. 12. Bonilla ED, Stevenson RG 3rd, Yashar M, Caputo AA. Effect of application technique and dentin bonding agent interaction on shear bond strength. Oper Dent 2003;28:568-73. 13. Kumar D. Comparitive evaluation of micro shear bond strength of Adhesive resins to coronal dentin versus dentin at floor of pulp chamber - An in vitro study. J Cons Dent 2006;9:123-30. 14. Yoshiyama M, Tay FR, Doi J, Nishitani Y, Yamada T, Itou K, et al. Bonding of self etch and total etch adhesives to carious dentin. J Dent Res 2002;8;556-60. 15. Lee S.Y.LinT.C storage effects on dentin structure and on resultant composite bond strengths. J Oral Rehabil 1997;24:823-34. 16. Friedl KH, Powers JM, Hiller KA. Influence of different factors on bond strength of hybrid ionomers. Oper Dent 1995;20:74-80. 17. Velazquez E, Vaidyanathan J, Vaidyanathan TK, Houpt M, Shey Z, Von Hagen S. Effect of primer solvent and curing mode on dentin shear bond strength and interface morphology. Dent Materials 2003;34:548-55. 18. Sen BH, Büyükyilmaz T. The effect of 4% TiF4 solution on root canal walls - A preliminary investigation. J Endodontics 1998;24:239-43. 19. Gallo. Shear bond strength of four filled dentin bonding systems. Oper Dent 2001;26:44-7. 20. Lopes GC, Vieira LC, Monteiro S Jr, Caldeira de Andrada MA, Baratieri CM. Dentin bonding: Effect of degree of mineralization and acid etching time. Oper Dent 2003;28:429-39. 21. van Rijkom H, Ruben J, Vieira A, Huysmans MC, Truin GJ, Mulder J. In vivo Erosion-Inhibiting effct of NaF and TiF4 treatment. Eur J Oral Sci 2003;111:253-7. 22. Anusavice KJ. Philips science of dental materials. 10 th ed. Bangalore: Prism books Pvt. Ltd; 1996. p. 709. 23. Arnold- Dial AM, Williams VD, Aquilino SA. In vitro A review of dentinal bonding: The substrate. Oper Dent 1990;15:71-5. 24. Sehgal A, Rao YM, Joshua M, Narayanan LL. Evaluation of the effects of the oxygen- inhibited layer on shear bond strength of two resin composites. J Cons Dent 2008;11:159-61.